It’s surprisingly easy to add a racing stripe to the leggings pattern. The process is really just color blocking, so if you were following along with color blocking 101 or our color blocked raglan tutorial this will be familiar to you. 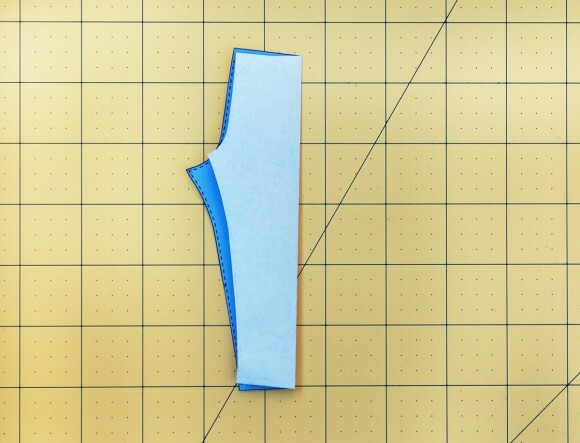 Once you’ve made the crease, open it up and draw a straight line along the fold. This is the location of our theoretical side seam. Now it’s time to decide how wide to make the racing stripe. Two inches seems about right to me, but the width of the stripe depends entirely on the look you want and the size you’re making. 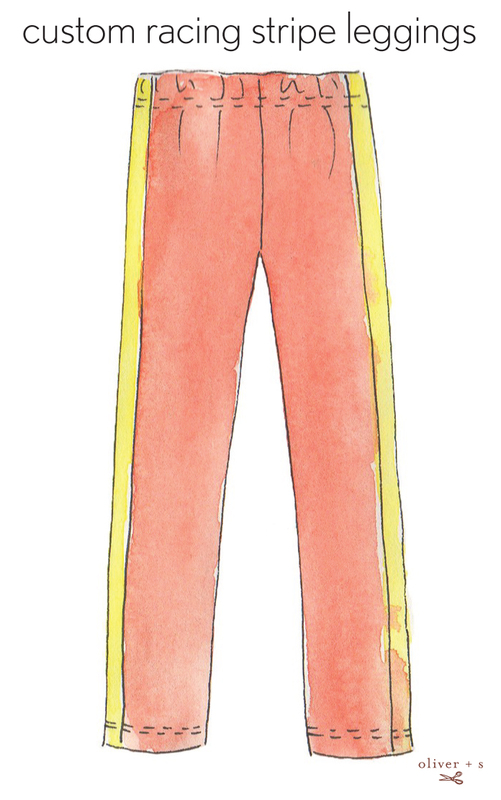 (Larger sizes could support a wider strips and smaller sizes would probably look more balanced with a smaller stripe.) Draw the stripe over your faux side seam, either centering it (mine would be 1″ on either side of the side seam line if this mini-pattern was real size) or pushing the stripe slightly toward the front of the leggings if you like. 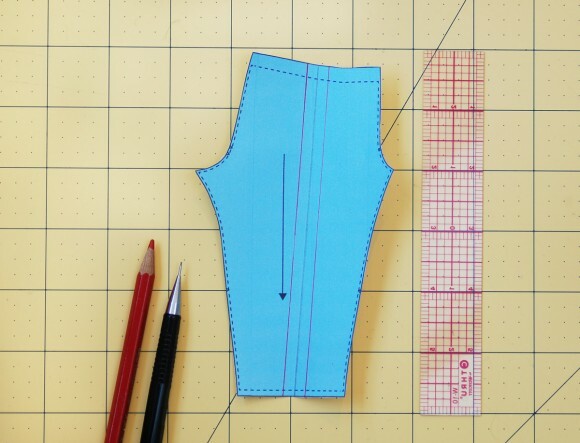 You might decide to put 1 1/2″ of the stripe at the front and only 1/2″ on the back. It depends on the look you’re going for. My stripe lines are red in this photo so you can distinguish them from the pencil-drawn side seam line. 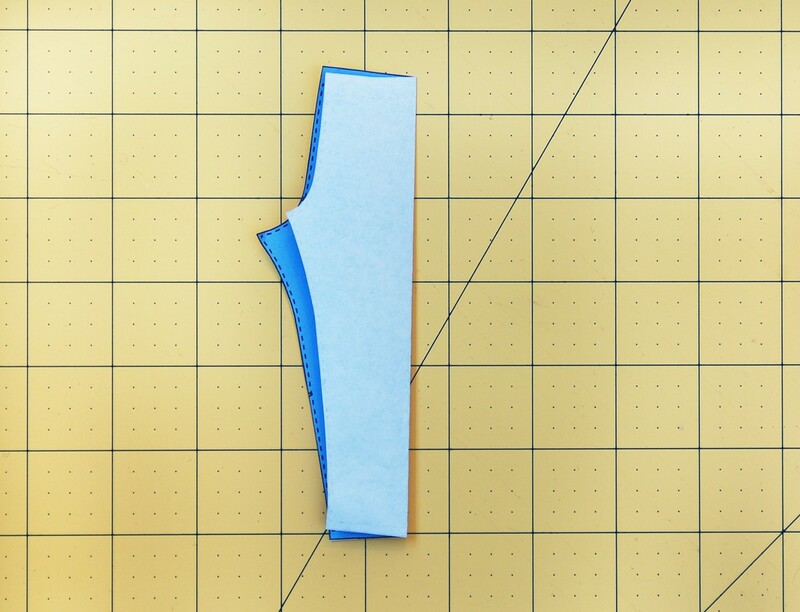 Once you’ve added the seam allowances you can cut your fabric. The grain line for all the pieces can be parallel to the stripe lines now, so that will make it easy to lay out and cut the pieces from fabric. Most knit fabrics don’t stretch as much in the warp (the length) as they do in the weft (the width), but you’ll still want to use a stretch stitch when you sew the pieces together along these vertical seams to make the stripe. 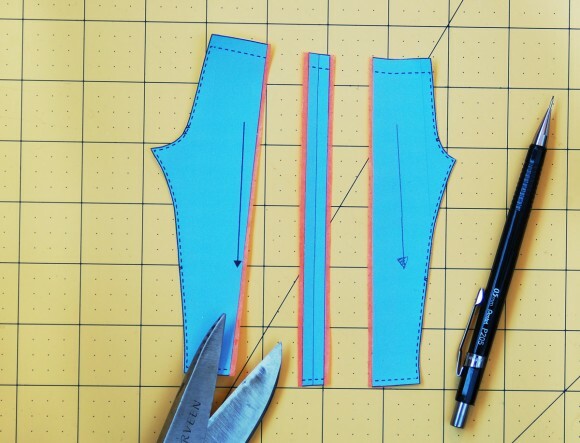 And once you’ve re-assembled the pieces and the stripe is in place, you can continue to assemble the leggings in the usual manner, following the instructions. 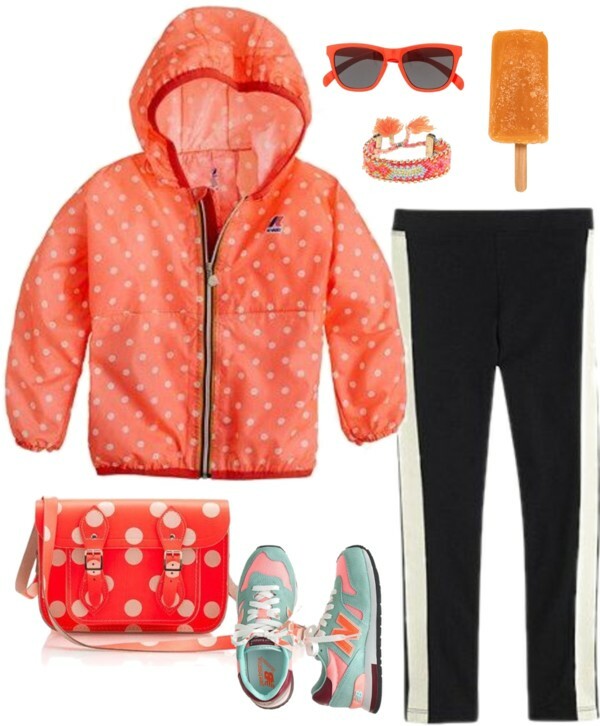 Oh, and you want styling? Ok! By the way, if you’re reading these posts and feeling at all nervous about sewing with knit fabrics, don’t be! Here are a few tips, and we have lots of detailed instructions in the leggings pattern instructions themselves. We include those instructions with all our patterns designed for knit fabrics, so you can feel confident that you’ll be able to tackle a new challenge and I’ll be there to hold your hand. Well, maybe not personally. Buy you know what I mean. Thank you for the explanation, it really helps to understand how to modify patterns. I have the challenge of narrowing patterns and wanted to ask if this side seam line that you explained how to find is also the line for narrowing the leggings? Or should I find a line that is parallel to the grain? 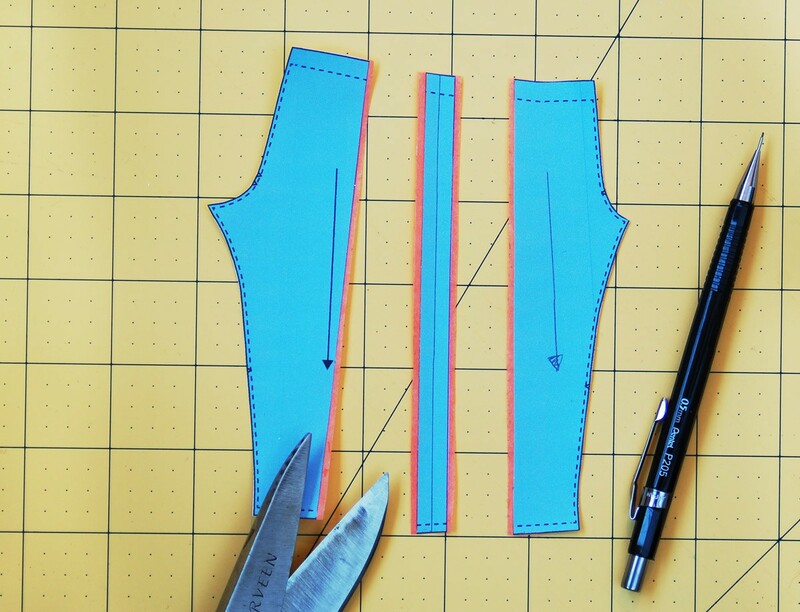 Yes, you could make it narrower by cutting along the “faux side seam” and sliding the pieces over each other a bit. You’ve got it! Carolyn, thanks for the very kind words! It’s always wonderful to hear that we’re helping you learn to sew. And you look like you’ve become quite an accomplished sewist! Very nice work. Thanks for explaining, It’s really helpful how to customizing the leggings..